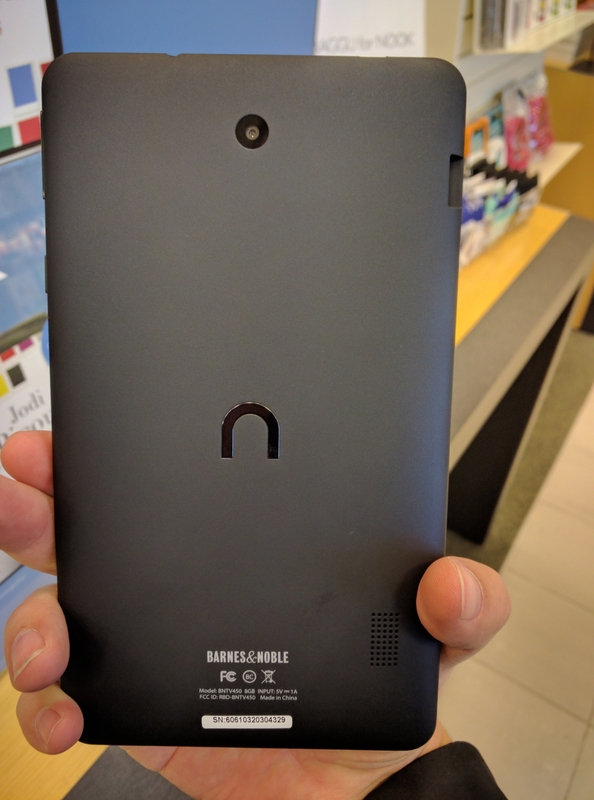 The Nook display counters were right up at the front of the store, and the 7″ $50 tablet was right there–but the employee noticed that it had been unplugged and was dead. She went back and got a working one and stayed there to keep an eye on me while I fiddled with it. Come on baby, light my…Nook? 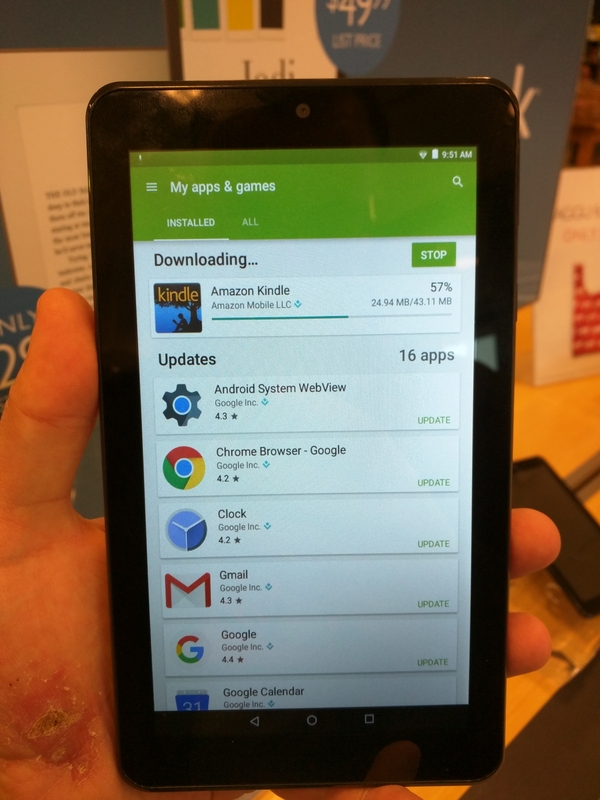 The first thing I noticed on picking this tablet up was how very much like a 7″ Fire it was. It has the same size and shape, the cameras and speaker grille are in the same place (I think the micro-SD card slot is, too, but I’m not sure), and about the only major difference I could spot was that the volume and power controls seemed to be differently placed at the top right. I wish I had thought to bring along my Fire so I could have photographed them next to each other for a direct comparison, but as you should be able to see from the photos I did take, they’re definitely similar. Update: Once I was home and able to look at my Fire again, I was able to see they weren’t actually as identical as I thought. The camera, speaker, controls, and chip slot are all actually in different places after all. I was fooled by the way they were so similar–right down to using the same backplate style of slightly curved, roughened plastic with an embossed logo in the middle. It’s funny to consider how remarkably similar they are. But then, I believe that sort of design element isn’t something one can patent or trademark, so if they’re trying to duplicate the Fire in every respect, copying the overall design style is a no-brainer. 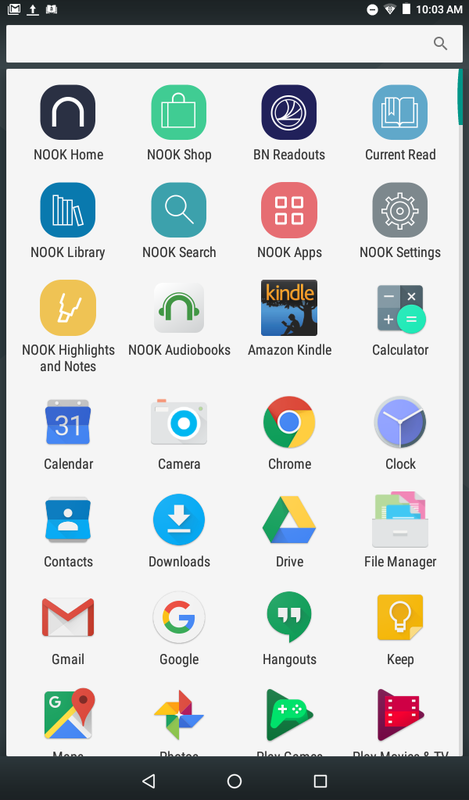 I’m not sure what launcher it’s using, but the Nook Tablet 7″ is definitely running plain-vanilla Android. The first thing I did after hooking up WiFi was to go into the Settings panel and log in using my Google account. 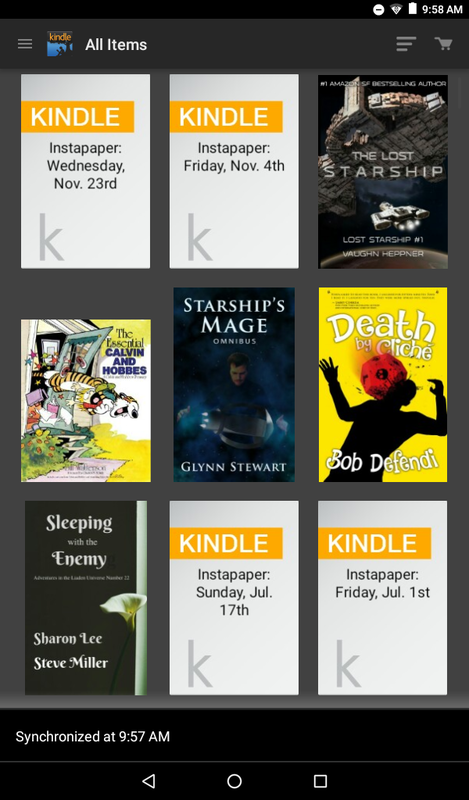 From there, I could open the Play Store, and perform the ultimate test of app use feasibility: I installed Kindle on it. And it installed and loaded up without a hitch. You can even see the icon in my screenshot of the app drawer. It ran just fine, hooked up to my library after I logged into Amazon, and then downloaded Ready Player One to read. 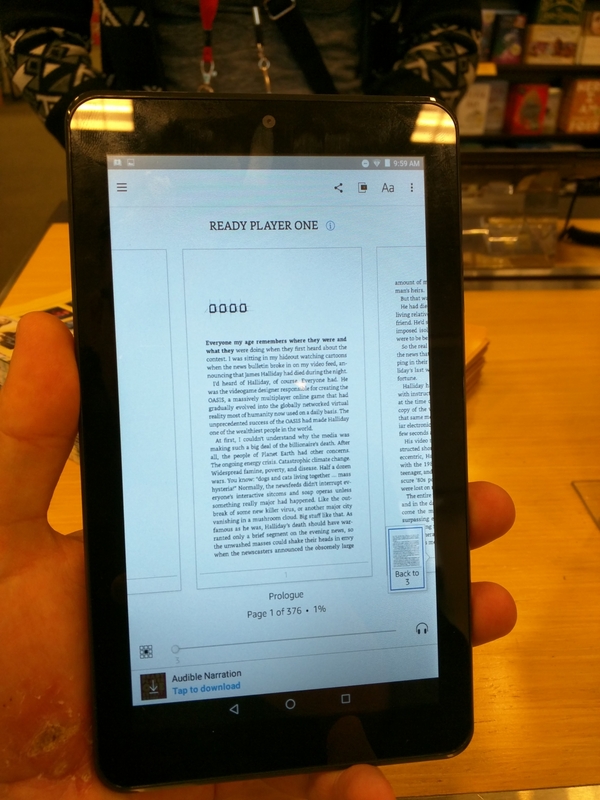 I didn’t play around with adding any other e-reader apps–I didn’t want to exhaust the patience of the B&N employee–but if it will run Kindle, it will almost certainly run anything else. I can also confirm that it definitely has Bluetooth–but that’s not exactly a surprise, since even the $50 Fire has that. As a plain-vanilla Android tablet, naturally it had all the Google apps, including Chrome. I pulled up TeleRead on it just for fun, and found it to be every bit as readable as on any other Android tablet I’d used. I did have a little trouble taking screenshots by holding the volume button and power button at the same time, so I got the volume interface in the shot. I didn’t really want to bother with taking another one, so I just used that one. The resolution of the screen may not be the best, but like the Fire it’s about as sharp and clear as a screen in that range could look. 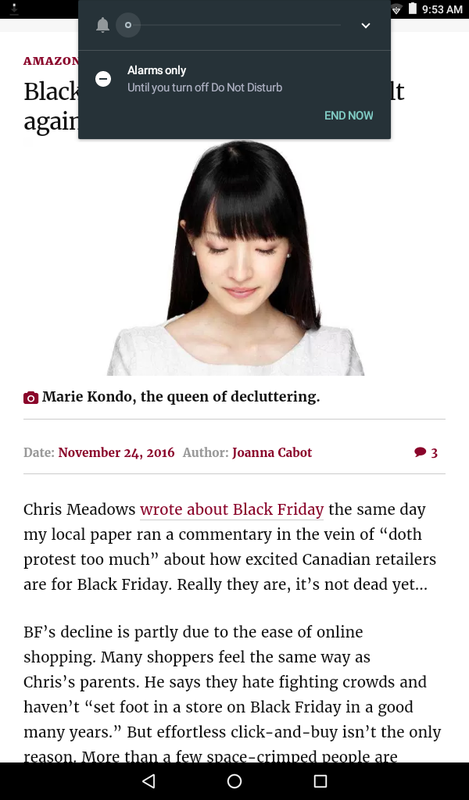 I’m pretty sure I could read from it at length; I’ve read longer on worse. It’s absolutely usable if you’re on a budget. I did notice the tablet’s response was a little sluggish sometimes when it came to launching programs or installing applications, but on a device this inexpensive, that’s only to be expected. And it’s a really slick little package. I’ve already got several Android tablets and an iPad Mini to boot, so it’s not as if I’m entirely bereft of mobile ways to access the Internet, but I still feel a pang of gadget lust when I look at it. If Barnes & Noble can keep up with demand, and capitalize on placing so many of these tablets with people, maybe it could go some way toward redeeming the troubled, loss-ridden Nook brand. I didn’t want to monopolize the tablet forever, as there were going to be other people wanting to look at it, so I deleted the Kindle app, removed my Google account from the device, and handed it back. Then I headed over to the cafe to take a table and write this report. Granted that I only had a few minutes to form impressions, my final takeaway is that this is an even better low-end tablet than the Fire. It’s got the same basic specs, but will run any compatible app from Google’s or anyone else’s app store–including Amazon’s. No more do you have to put up with the trade-off of giving up Google Play to get a rock-bottom price. If you want to consume media from Amazon, Barnes & Noble, or anyone else, this tablet is for you. If you want a good tablet for kids that you won’t be too financially bothered if they drop and break, this tablet is for you. I don’t know how its parental control features compare to the Fire’s, but given that it runs ordinary Android apps, you’ve got every solution in the Google Play store to choose from. And if you know someone who needs to bridge the Digital Divide but doesn’t have much money to spend on it, they should also take a look here. AndroidB&NBarnes & NobleFirekindleNookNook Tablet 7"
Next Next post: Digital Book World in January includes Indie Authors Conf. I’ve used the Nexus 7, the nook, the iPad, and the basic Kindle extensively. Comparing Nook to Kindle, the Kindle is many times faster, offers a larger array of books, and has been fault free for close to seven years. I think I’ve read 134 book. The more than $250 Nexus 7 is quick and easy to read and also offers sound for free classic audio books. Also, I dropped my Nexus 7 and unseated one of the cable plugs for the video. I was able to spit the case and re-seat the plug and I was back in business in a half hour. Considering all things, I’ll buy another $80 Kindle when the time comes. Does Amazon’s instant video app work on this? I didn’t have the opportunity to test it, but as far as I know there is no reason why it shouldn’t work just as well on this as on any other plain-vanilla Android tablet. If this had been put out last year, I might have bought it instead of the Fire. But since I already have the Fire, I don’t really see the need to replace it with a near-clone. The biggest advantage this has is not being tied to Amazon, and I’ve been able to work around the Fire’s limitations. One oddity, you say that the camera and speaker are on the same place as the Fire, but your picture shows them on the back centerline. On my Fire (the 2015 model), those are on the side of the back. Are you comparing with a different model of Fire? No, I was just mistaken. I’ll be editing the post to that effect here in a bit. You didn’t make a comment about the speed, how responsive it feels. Of course it was brand new, so may have not noticed that after installing one app. Did you bothered checking which type of processor it uses? I cannot find information about it. I read someone saying the Fire is many times faster. I’m looking at this Nook as an option for my kids -for the same reasons you stated- but I’m worried that if it is slow for games they may lose interest. I didn’t really have it long enough to figure much out about the speed—other than, as noted in the post, I did notice a little sluggishness in switching between apps sometimes. If I were to buy (or someone were to buy me) one, I could run benchmarking tests on it and so forth. I’m not sure I’d assign much weight to claims that it’s “slower than the Fire” because it’s actually supposed to have the same CPU as the faster Fire HD 8, and there are simply too many factors that can affect one’s perception of speed. It’s not going to be the fastest thing ever for just $50, no matter how fast it is. But ask your kids whether they’d rather have a slowish $50 tablet or no tablet at all and see what they say.